I love to walk, but a recent series of alarms have sounded. Walking can be hazardous to your health and may even be deadly. The latest statistics available (2016) are sobering. According to AAA, there has been a 60 percent increase in hit-and-run vehicle deaths for pedestrians since 2009. Distracted driving is a key factor in this since, according to an Arity survey, 42 percent of drivers say they text while driving. As if this was not enough to make me sit up and take notice, the screaming headlines this week in both the Detroit Free Press and USA Today said: “Pedestrian fatalities at crisis level” and “Death on foot: Pedestrian fatalities skyrocket in U.S.” Yikes! Vehicles aside, in a Speak Out letter in Tuesday's Cadillac News, local resident Karyl L. Stoutenburg pointed out another pedestrian hazard – loose dogs. “I cannot understand why dog owners feel it's safe for their dogs to run free.” I totally agree and have pretty much given up walking in some Cadillac neighborhoods after being accosted and chased by unleashed canines. (My latest confrontation happened this past Wednesday.) It's just too dangerous. All of that said, the benefits of walking far outweigh the alternative of hiding in my basement, The key is to find safe routes where I can stretch out without fear of being mowed down or chewed upon. Luckily, Cadillac has a prime option. Spoiler alert. This is my annual endorsement for the Keith McKellop Walkway along Lake Cadillac. Simply put, it's a gem. Combined with a section of the White Pine Trail between the City Park and Sunnyside Drive and the Clam River Greenway from Lake Cadillac to 13th Street, and you have a safe trail system with very few streets to cross and entirely on sidewalks (not road shoulders). You can string together a customized distance to fit your needs. 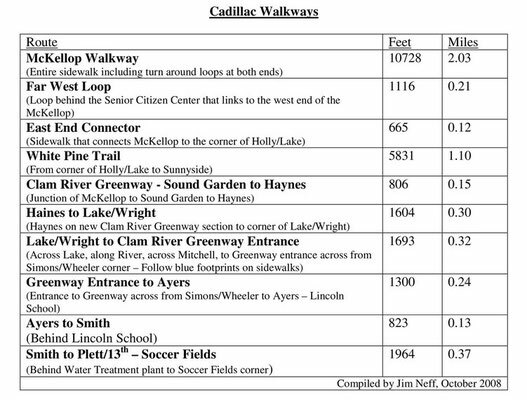 I have calculated the length of the various trail segments by going old-school – measuring (on foot) with a walking wheel provided by City of Cadillac engineers. No GPS guesstimates. A distance chart (printable) is at: https://www.neffzone.com/cadillac-walkways/. Now comes my pitch for a walking route that is near and dear to my heart – the Cadillac KISStory Tour. 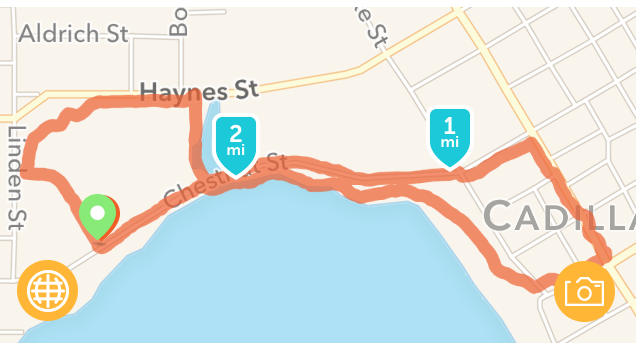 This is a 2.4 mile route that includes parts of the McKellop. The tour begins at the KISS Monument on Chestnut Street at the southeast corner of Veterans Memorial Stadium. Just follow the map on the markers as each marker tells a part of the story of the KISS visit to Cadillac in 1975. Pictures of the markers and a printable map is at http://kisscadillac.com/take-the-tour/. I will warn you that to take the complete tour requires you to cross Mitchell Street twice. If you do not want to do this, stay on the west side of Mitchell and just spy the KISStorical marker located next to the Sweet Shop from across the street. I walk the KISStory Tour a couple of times a week, so if you see me please do not hesitate to join me for a first-hand narration. I also stop at the Monument whenever I see someone there and doing so has led to great conversations with hundreds of tourists every summer. You can always ask me questions and request a personal tour at: https://www.neffcadillackiss.com/ask-jim/. The key thing is to keep walking, but to do so in a safe environment. Fortunately, Cadillac has just what the doctor ordered. 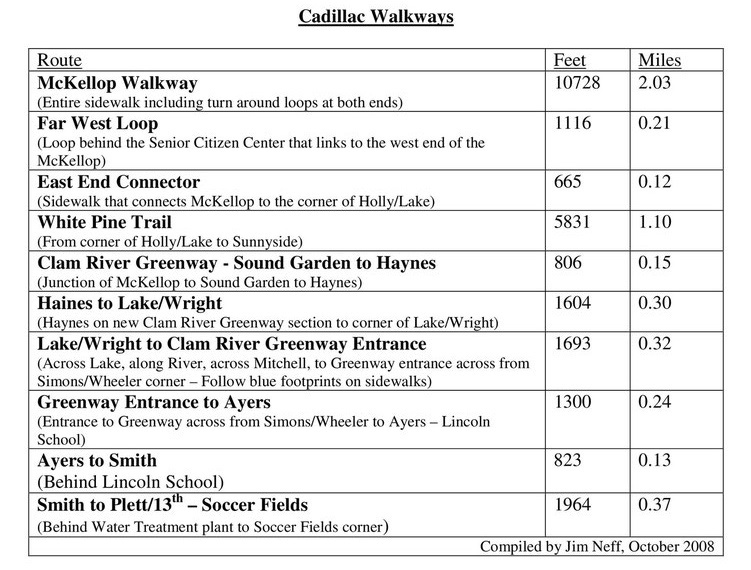 Cadillac Walkways Distance Chart and the Cadillac KISStory Tour route. Click on either for a full size image.